Joan Steitz will give the John Kendrew Lecture 2013 on Friday 1st November at 4.15pm in the LMB’s Max Perutz Lecture Theatre. The title of the lecture is ‘Non-coding RNAs: with a viral twist.’ This event is open to anyone in the local area who is interested in attending. 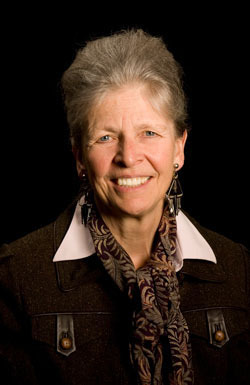 Joan Steitz is interested in the multiple roles played by non-coding RNA–protein complexes in gene expression in vertebrate cells. She is best known for discovering and defining the function of small nuclear ribonucleoproteins (snRNPs), which occur only in higher cells and organisms. Joan was accepted into Harvard Medical School in 1963 but moved to the graduate programme in Biochemistry and Molecular Biology. She was the first female graduate student to work under Jim Watson’s guidance. Joan came to the LMB in 1967 to do her postdoc with Mark Bretscher. In 1970 she joined the Department of Molecular Biophysics and Biochemistry at Yale, as an assistant professor, then became a professor and later the chair of the department. She is a member of the American Academy of Arts and Sciences, the National Academy of Sciences and the Institute of Medicine. Joan is currently Sterling Professor of Molecular Biophysics and Biochemistry at Yale University and continues her work with the Howard Hughes Medical Institute (HHMI). She is an advocate for gender equity in the sciences. Noncoding RNAs play pivotal roles in the regulation of gene expression. They exhibit a diversity of functions whether encoded by cellular or viral genomes. I shall present several recent stories related to non-coding RNAs produced by the oncogenic gamma herpesviruses. These will illustrate the habit of viruses to acquire components from their host cells but then utilize them in unanticipated ways to enhance the viral life cycle. Furthermore, these studies provide insights into the evolution of both viruses and their host organisms. The John Kendrew Lecture is named in honour of LMB Nobel Laureate John Kendrew. It is one of a series of named lectures organised by the LMB to be given by eminent scientists from around the world. John Kendrew was born in Oxford on 24th March 1917. He studied chemistry at Trinity College, Cambridge and graduated in 1939. During World War II he worked on radar for the Air Ministry Research Establishment. In 1946 he returned to Cambridge and joined Max Perutz at the MRC ‘Unit for Research on the Molecular Structure of Biological Systems’ (now the MRC Laboratory of Molecular Biology) where his research focused on protein structure and the X-ray analysis of myoglobin. In the 1960′s John jointly founded the European Molecular Biology Organisation (EMBO) and helped create and was first Director of the European Molecular Biology Laboratory (EMBL). He also founded and was Editor in Chief of the Journal of Molecular Biology. From 1981-1987 he was President of St John’s College, Oxford. He died in Cambridge on 23rd August 1997.